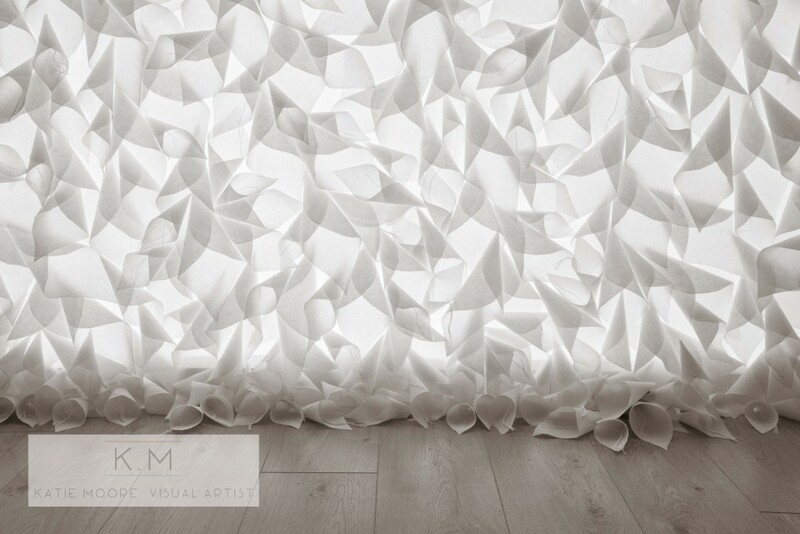 Last Saturday the 25th of June marked the final day of my Paper Bloom exhibition. I have been artist in residence at the Jackie Clarke collection since last September 2015, the time has really flown by, but I have enjoyed every minute of it, and learned so much. I was blown away by all the people that showed up for the closing event, it was lovely to see so many people. My Paper Bloom limited edition publication was also launched at the closing event, we were giving away one free copy to everyone who attended. Edel Golden, the manager of the Jackie Clarke Collection was the MC for the event, she did an amazing job. Aidan Dunne, Irish Times Art Critic, was the guest speaker, he spoke so beautifully, it was lovely to hear what he had to say about my work. I said a few words to give people an insight into Paper Bloom, and to say thank you. My Paper Bloom publication is a permanent documentation of my Jackie Clarke Collection residency. Thank you to everyone for coming to the closing event of Paper Bloom and my publication launch. I hope you enjoy my book! Closing Event and Publication Launch in one hour! See you all in one hour for the closing event of Paper Bloom and the launch of my limited edition publication, with guest speaker Aidan Dunne, Irish Times Art Critic. Tomorrow is your last chance to see my exhibition Paper Bloom! The closing event and publication launch is at 3pm at the Ballina Civic Offices, with guest speaker Aidan Dunne, Irish Times Art Critic. 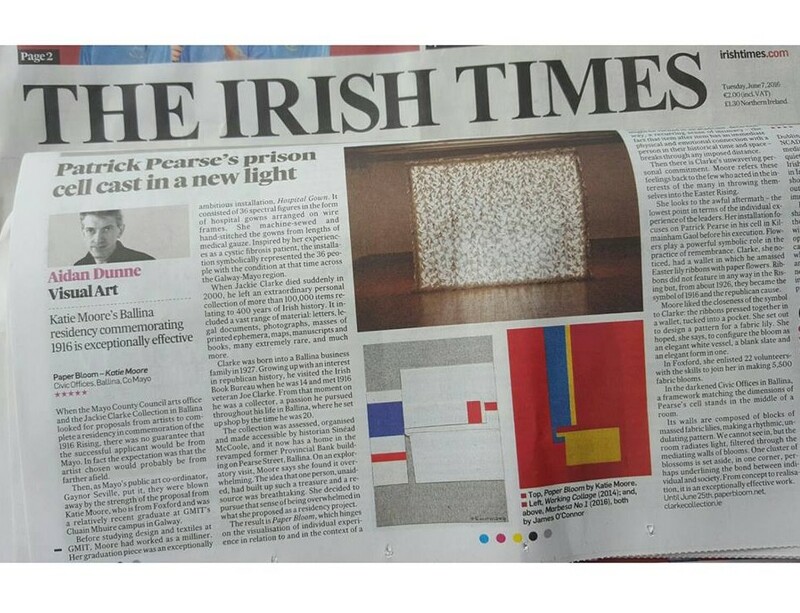 A big thank you to Aidan Dunne, Irish Times Art Critic, for the review of my exhibition Paper Bloom….. 5 stars! I can’t believe there are only ten days left until the closing event and publication launch of my Paper Bloom exhibition. I hope to see you all at the event on Saturday the 25th of June at the Ballina Civic Offices at 3pm, with guest speaker Aidan Dunne, Irish Times Art Critic. The publication is limited edition (and free), it is only available to those who show up on the day. Paper Bloom is open Monday to Friday 10.30am – 4.30pm at the Ballina Civic Offices until the 25th of June. The Paper Bloom community exhibition at the Seomra in the gardens of the Jackie Clarke Collection is open Tuesday to Saturday 10am – 5pm, until the 25th of June. The Paper Bloom community exhibition is installed at the Seomra in the Jackie Clarke Collection. The installation consists of lilies handmade from paper, they are suspended from the ceiling and hanging around an empty chair, the empty chair makes me think of Jackie and he is surrounded my his community. I really enjoyed working with the community groups, from what I have been told Jackie really loved his town, so it was important to me to have the town involved. The Paper Bloom community exhibition is at the Seomra in the gardens of the Jackie Clarke Collection is open Tuesday to Saturday 10am – 5pm, until the 25th of June.